Alright, so we said we had 2 Canadian camps to share with you since summer is right around the corner. Will you be sending your kids to summer camp? Our first recommendation was CircleSquare Camp, another great kids camps recommendation is #PioneerCamp. These camps offer personal growth for your children and a pretty awesome sweepstakes for a trip for 2 to go to Punta Cana, Mexico and a week of free camp time! Keep reading to find out more! PioneerCamp has camps in 4 provinces: Pacific Pioneer Camp, Pioneer Ranch Camps in Alberta, and Pioneer camps in Manitoba and Ontario. These summer camps each offer a slightly different experience and adventure from one another but are all Christian Camps operated by the Intervarsity Christian Fellowship. These overnight camps build character and teach essential skills all the whilst letting kids have fun and develop their Christian faith. Want an incentive to sign up for camp? 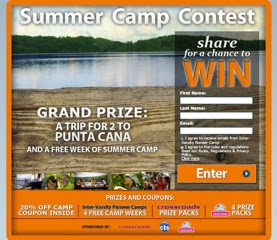 #PioneerCamp has made special offers and deals available for Mabel’s Labels, discounts off of camps for first-timers and more in their trip to Punta Cana and a free week at Pioneer Camp Sweepstakes! Earn more entries for friend referrals. Easily share your link with buddies by using the share buttons on the top of the form or anywhere else with your PURL. Good Luck. The sweepstakes are live now and ends June 15, 2012 11:59PM EST. Open to CANADA, excluding Quebec. See Full rules and regulations for prizing information. The two camps I am mentioning are offering the same prizes but they are not sharing between the two of them. I.e. There are 2 Punta Cana trips being given away. Like InterVarsity Pioneer Camps on facebook.